50th Anniversary or 50th Birthday DVD from 1969. This DVD has the original black and white footage from the news, world events, music, sports, entertainment and more all from that year. 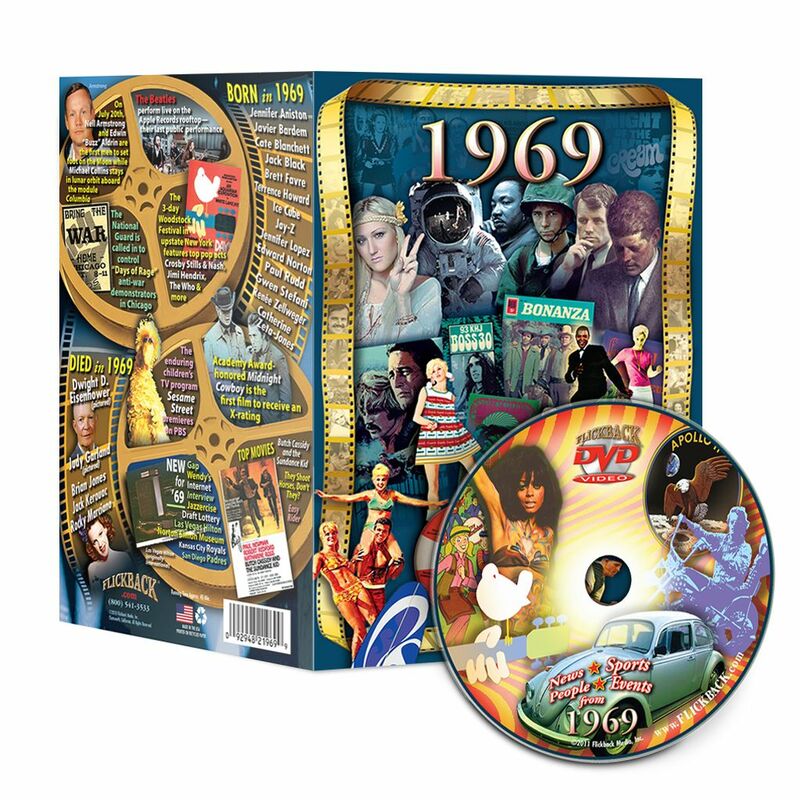 That is just a few of the many attention-grabbing video of this 1969 DVD, which can be used as a 50th birthday DVD or a 50th anniversary DVD. Choose another 50th anniversary gift. What WE say about our DVD: Similar to the book we sell for the specific year, this DVD can also be used as either a 50th birthday DVD or even as a 50th anniversary DVD. The video does not mention a particular occasion when it's playing- it just focuses on the year that's being featured, so it's fine to use it for either one. expect to see a lively format showing you little clips of things that happened that year, as well as mentioning some of the music from the year, big sports events like baseball, football and big news stories. It plays for about thirty entertaining minutes, so it also makes for a way to entertain guests at the party or 50th birthday event. You can set it up to continually play as guests wander around the event center, or show it to them all at once if you prefer. When the couple watch the DVD they will start to say things like, "oh, I remember that!" or "gee, I forgot about that until just now.." One fun 50th anniversary party idea is to film them watching the DVD- it is a funny way to remember the fun they had receiving your gift.